Let's face it, everyone is constantly looking for something that will give their brand the edge over competitors brands. Vivid Promotions has a great range of fun and innovative promotional products that will ensure your corporate logo is seen and remembered. From Printed Novelty Promotional Products, Branded Promotional Toys and Customised Gadgets, we have the lot! Think outside the square and add that little something extra to your next event. Fun Memo Pad: Check out this cool Promotional Memo Pad with solar clock. 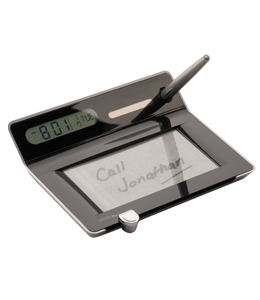 Simply write your message onto the magnetic screen with the pen provided and erase after use. Not only can kids have magnetic drawing pads, now adults can too! Print your corporate logo onto this funky Memo Pad and create a lasting impression. 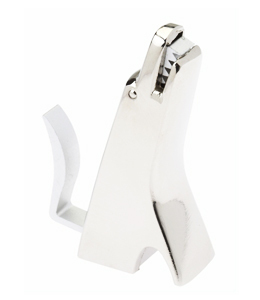 Guard Dog Memo Clip: This Guard Dog Memo Clip is a fun way to hold your notes and memos in the office or at home. Presented in polished chrome with matt aluminium teeth, this Guard Dog Memo Clip can be laser engraved with your promotional logo or message. A fun merchandise item that is suitable for all ages and genders. 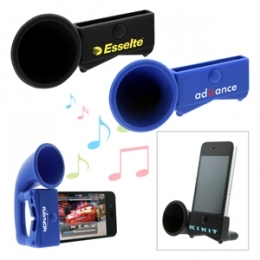 iPhone Megaphone Speaker: Is a fun promotional product for many occasions. The silicone speaker/ stand allows you to take your music everywhere you go and create some hype about your corporate message. Available in 4 colours, the iPhone Speaker can hold the phone vertically, horizontally and has an opening on the base for a charger. 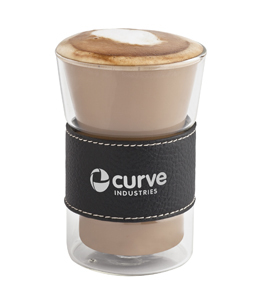 Kona Double Wall Mug: This stylish coffee cup is designed with 2 layers of glass so it's easy to hold when holding your hot cuppa. Presented with a corporate designed leatherette band around the middle, you can print your company logo and name. Ideal as a gift for Christmas, Staff Incentives and corporate giveaways. Vivid Promotions has a wide range of fun and innovative promotional products to ensure your brand stands out in a crowd! It's easy to give your client a promotional pen or a bag, which are still fantastic low cost products however more and more clients are coming to us asking for innovative and different ways to get their message out there. Quirky Promotional Products and Stylish Printed Merchandise Items are a unique way to grab attention and leave a lasting impression in client's minds. Take a look at some of our custom made and branded Promotional Products that can relate to your theme, event or fundraiser; Printed Promotional Bottled Water, Decorated Digital Photo Frames, Branded Confectionery and Promotional Game Sets are just a few fresh and modern merchandise items that are sure to make your clients look twice! If you are after a more corporate look with a hint of individuality, then check out Vivid Promotions' Engraved Multi Tools, Themed Stress Shapes or Branded Sunglasses. Contact our friendly sales team today to organize a custom quote on 1300 72 70 92. IMPORTANT NOTE: Discounted pricing does not include Set up costs, 10% GST or delivery charges. Yes of course, it\'s worth the money but why buy 450 usd media smart when you can altaulcy put something together pretty cheap that will run a game server flawless. You can also get a supermicro for that price too, thought a 1U is a bad choice just to have on the desk at home and you need to pay for co-location. You can also rent a game server/server/VPS which is pretty cheap too! Simply want to say your article is as ashniosting. The clearness in your post is simply excellent and i could assume you are an expert on this subject. 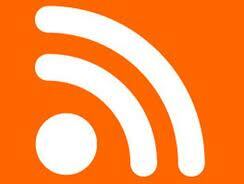 Fine with your permission allow me to grab your RSS feed to keep updated with forthcoming post. Thanks a million and please carry on the enjoyable work.